Sky's the limit for this top dog pooch! Intelligent, energetic and good looking! 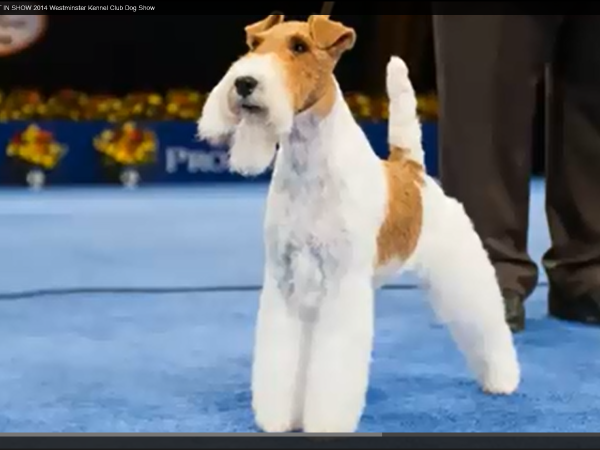 The wire fox terrier, a breed of dog part of the terrier family, has been selected as America’s top dog, after winning best in show at the Westminster Kennel Club, New York. Isn't he just too adorable? Sky was top dog at a recent competition to find the best show dog. The wire fox terrier, a breed of dog part of the terrier family, has been selected as America’s top dog, after winning best in show at the Westminster Kennel Club, New York. He beat a poodle, a Portuguese water dog, a bloodhound, an Irish water spaniel, a Cardigan Welsh corgi and a miniature pinscher. Wire fox terriers have a history of fox hunting, where they were developed in England for the purpose of chasing foxes into their underground burrows. Their stubby, strong tails were used by hunters to pull them back out. Always up for the adventure, the wire fox terrier has an expectant and alert expression on its face. The good-looking breed of dog has won the prestigious event for the 14th time. No other breed has managed to win more than 8 times, making the wire fox terrier a firm favourite. According to CBS news, there were 2 856 dogs entered into the dog show, from 190 different breeds and varieties. Other famous wire fox terriers include the much-loved Snowy, Tin Tin’s sidekick and companion. Rudyard Kipling, English short-story writer, novelist and poet also had a wire fox terrier named Vicki. Kipling is known for his popular work of fiction, The Jungle Book, in addition to other popular works such as Kim and Just So Stories.